Overview - From Disney and creative genius Tim Burton (“Alice in Wonderland,” “The Nightmare Before Christmas”) comes the hilarious and offbeat “Frankenweenie,” a heartwarming tale about a boy and his dog. After unexpectedly losing his beloved dog Sparky, young Victor harnesses the power of science to bring his best friend back to life—with just a few minor adjustments. He tries to hide his home-sewn creation, but when Sparky gets out, Victor’s fellow students, teachers and the entire town learn that getting a new ‘leash on life’ can be monstrous. A boy's best friend is his dead dog in Tim Burton's 'Frankenweenie,' an extended remake of the director's 1984's short film which didn't see the light of day until a decade later and cost him his job with the same studio now fronting this lengthier animated version. It's an interesting piece of cosmic irony, particularly since he was fired for making something deemed too scary for younger viewers. Thirty years later, the same could still be said of this longer take, which adds an extra 50-minutes of spooks and frights to the original and sees neighborhood kids bring their beloved pets back from the dead. Yet, the heartwarming story of a boy and his dog is the glue keeping everything together, even when things are at their wildest, mixing the scares with plenty of laughs. The central plot remains the same, however, with little Victor Frankenstein (Charlie Tahan) losing his hairy companion while chasing a baseball into the middle of the road. His parents (Martin Short and Catherine O'Hara) do what they can to comfort him, but the intelligent kid with a passion for science is set on reviving his slobbering buddy. Victor tries to keep his act against nature a secret, and the upcoming school science fair is the perfect guise from which he can work without suspicion. An oddly cute scene has him sneak by his parents, who are watching Hammer Film's classic 'Horror of Dracula' with Christopher Lee, while dragging a burlap sack with the remains of his dog. Shortly after, crabby next-door neighbor Mayor Bergermeister (also voiced by Short) sees Victor on the roof setting off kites and an umbrella during a thunderstorm. The entire sequence echoes the same feel and look of James Whale's two 'Frankenstein' features, awash in dark, ominous shadows and shot in a variety of canted high angles. It's not long before the town catches wind of the experiment, thanks largely to the hunchbacked Edgar Gore (Atticus Shaffer) who looks a bit like a child-version of Peter Lorre, and the story makes an obvious departure from its source, suddenly growing in size and scope. Writing credits this time around go to John August ('Dark Shadows' and 'Big Fish'), who expands the parody and homage elements of Burton's original into a love letter to classic horror cinema. The aforementioned sequence, which was mostly taken from the short film, is only one of several clever but not very subtle references made throughout. For horror and stop-motion aficionados, 'Frankenweenie' becomes a quirky game of name that movie while younger viewers sit in awe at the amazing hand-crafted artistry that went into making this wonderful animated fantasy. Somewhere in the middle, 'Frankenweenie' loses a bit of its spark and edge, but it never loses much of its amazing charm with its knowing puns and nods to classic horror cinema. The stop-motion film is an enchantingly playful macabre tale which can frighten the youngest in the crowd, but it will fascinate and win over movie lovers who are still young at heart, giving Burton's directing career a much needed jolt of life. 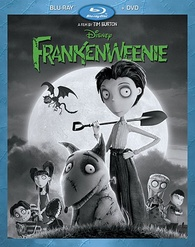 Walt Disney Studios Home Entertainment offers Tim Burton's 'Frankenweenie' in two Blu-ray options: a four-disc 3D package or a two-disc combo pack. For this review, the latter is being discussed. The first disc is a Region Free, BD50 sitting comfortably on the panel opposite a DVD-9 copy of the movie. At startup, the disc commences with a series of skippable trailers for other Disney features, and then switches to a menu screen with full-motion clips and music playing in the background. Despite being in black and white, which is in keeping to the film's homage of horror classics, the stop-motion family flick dazzles the screen with this reference-quality 1080p/AVC MPEG-4 encode (1.85:1). From the blades of grass to the stitching and threading of baseball caps, details are razor-sharp. Ultra-fine lines on the face of Mr. Rzykruski, the science teacher, like the wrinkles around his eyes or just over his mouth, are very distinct and defined. Individual hairs, whether on the various animals or atop the heads of characters, are plainly perceptible and seem to move freely with the wind. Close-ups are particularly impressive as they expose minor blemishes made during each figurines making, giving them a great deal of texture and realism. Contrast is pitch-perfect, with brilliant whites, allowing for some extraordinary moments of visibility of the smallest background objects in the distance. The tiny little lines on the windmill and the lettering of the town's name on the hill are as clear as anything else in the foreground during those extreme wide shots. Black levels are inky rich and true with a penetrating intensity in the darkest portions without sacrificing any of the detailing. Gradations in the grayscale are spot-on and exceptional. The overall 2D image has an appreciable three-dimensional feel of its own, making this a superb high-def transfer of a fun animated feature. 'Frankenweenie' comes to life on Blu-ray with a highly entertaining DTS-HD Master Audio soundtrack that surrounds and engages with a variety of classic horror cues. The most prominent effect is the sound of thunder and lightning, which cracks and booms with a deafening roar that spreads to all seven speakers evenly. During the less exciting scenes, such as during school hours, we can still hear a few atmospherics in the rears, creating a subtle but wonderfully engrossing soundfield. Danny Elfman's musical score does a majority of the work, consistently filling the background with its unique mix of circus-like merriment and understated gothic tones. In the front, imaging feels wide and expansive with other random discrete sounds which are convincing and engaging. Dynamic range is room-penetrating and extensive, allowing the crack of thunder to come in with astonishing clarity and distinctness. The orchestration in Elfman's music is vivid and crystal-clear. Low-frequency effects are responsive and substantial with some surprisingly authoritative moments in a few scenes. Amid all the mayhem, the voices of actors are precise and well-prioritized, giving fans plenty to love in this entertaining family horror feature. Frankenweenie Touring Exhibit (HD, 5 min) — The exhibit traveled the world showcasing the puppets, props and artwork used in the film. Music Video (HD) — The Plain White T's perform their cover of The Ramones song "Pet Sematary." Sneak Peeks (HD) — A set of previews. An extended and imaginatively expanded remake of Tim Burton's live-action short film, 'Frankenweenie' is a delightfully fun and macabre tale about a boy and his dog. Overflowing with several nods and puns, some more deliciously clever than others, the stop-motion family film charms its way into the hearts of movie lovers as a whimsical love letter to classic horror cinema. 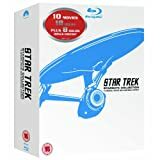 The Blu-ray comes to life with a reference-quality video presentation, excellent lossless audio and a strong assortment of bonus material, making the overall package is a recommended purchase.